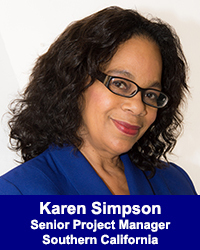 Karen Simpson - California Consulting, INC.
Karen Simpson joins Californian Consulting as a Project Manager located in Southern California. She has served within municipal government for 27 years for the Cities of Los Angeles, and Pomona, California. Karen has garnered her grant-writing skills for Federal and State funding opportunities from multiple Community and Economic Development programs. She has extensive knowledge and training in grant program management, grant research, grant writing, and post-award program compliance. She is skilled in building collaborates between community based organizations, faith-based entities, educational, and social institutions, which resulted in Federal grant awards totaling $10.4 million in less than 7 years. She has written grants addressing: at-risk children and youth, K-12 education, job training, homeless assistance, economic development, housing improvement, and lead-hazard control. Karen is an Independent Grant Consultant for non-profit organizations providing grant writing services, capacity building and funding strategies to help meet needs in underserved neighborhoods.